A beautiful and historic landmark with extensive, award-winning gardens, tucked away in idyllic Buckinghamshire countryside. A profile of Cheniesmanorhouse.co.uk was found on the social network Facebook. The web server used by Cheniesmanorhouse.co.uk is located in Netherlands and run by GoDaddy.com, LLC. 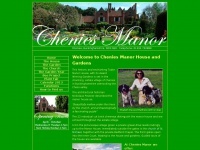 The website Cheniesmanorhouse.co.uk has a own web server. The web server only runs this website. The websites of Cheniesmanorhouse.co.uk are served by a Apache server. The online shop was build with software WooCommerce in the version 2.5.5. The HTML pages were created with the latest standard HTML 5. The website does not specify details about the inclusion of its content in search engines. For this reason the content will be included by search engines.